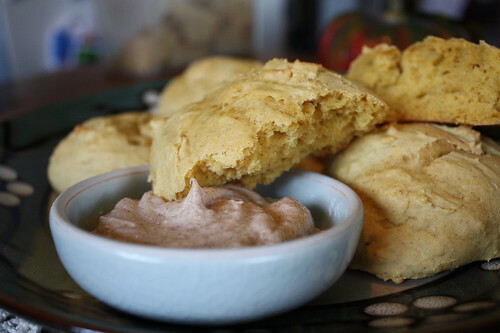 If you have a can or two of pumpkin leftover from the holidays (or if you cooked your own pumpkin), here’s an easy, quick and absolutely delicious recipe for pumpkin drop biscuits. I made these, and they came out light, fluffy and so scrumptious that the kids and I cleared a plate of them in just a few minutes. Yeah…they’re that good! Mix together all dry ingredients with a mixer. Cut in the butter and then the pumpkin puree. Slowly add milk until it reaches a desired consistency. It should be doughy, but slightly wet. Using a spoon, drop spoon-sized dough balls onto a pre-greased cookie sheet or pan. These are delicious all on their own, or for some added scrumptious goodness, you can serve with cinnamon butter. The biscuits should come out light and fluffy. 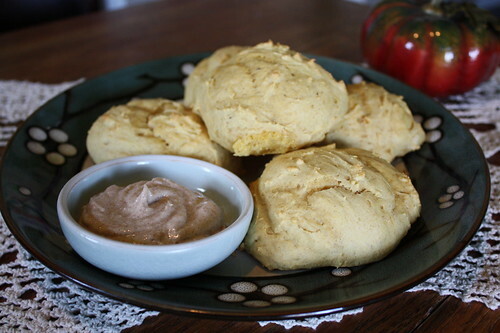 Whip ingredients together in a small bowl for 2-5 minutes, then serve with your biscuits. If you’re worried about how healthy this recipe is, don’t stress. I used all organic/raw ingredients, and this is a great way to start out a morning with the family. Yes you can have your comfort food and health, too! How would you serve these biscuits? Check out these and more Pumpkin Recipes here. Need to find the time to try these! They are super quick to make Evangelia! Making these tomorrow! Love a biscuit I don’t have to roll out! Do you use pumpkin from an 8oz can? I thought most pumpkin came in 15oz cans, but that is more like 2 cups. Just wanting to verify before I make. Thanks! Yes, sorry for the confusion on that Margo! Don’t have pumpkin pie spice. What would use? 1/2 tsp cinnamon 1/2 nutmeg? Try this Evangelia: 3 TB ground cinnamon, 2 tsp ginger, 2 tsp nutmeg, 1 1/2 tsp allspice and 1 1/2 tsp ground cloves. Made these tonight. They were delicious. My whole family loved them!